Our guide for the visit was Albert Coffee, an archeologist specializing in Mesoamerica who participated in the original excavation of the site. He began with an overview of the Mesoamerican region, a geographical and cultural area extending from north central Mexico through parts of Central America. Many ancient civilizations arose in Mesoamerica; the best known to us are the Mayas and Aztecs. Although the region covers a large area, the different tribes shared characteristics such as stepped pyramids, religious practices including animal (and human!) sacrifices and bloodletting, advanced calendar systems, ball games using a rubber ball, writing systems, and agrarian diets based on corn, beans, and squash. 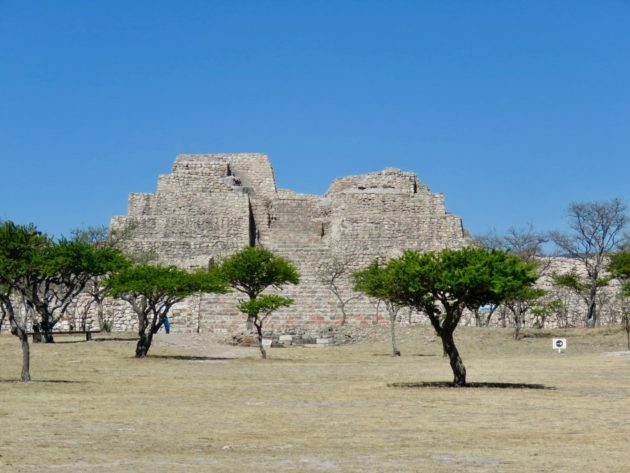 Cañada de la Virgen is a good example of the technologically, architecturally, and astronomically sophisticated cultures that developed in Mesoamerica. As we approached the main area, Albert pointed out the gorges that surround the mesa—themselves a botanical treasure, with many unique plant species—as well las the volcanic rock typical to the area. Wild donkeys and horses roam freely. The site, the northernmost Pre-Columbian site to be found thus far, was settled first by the Otomi people thousands of years ago, and then by the Toltecs and Aztecs. Scholars think it was part of a larger system consisting of about 60 pre-Hispanic settlements. Construction on the religious complex began in 540 AD, and the site was occupied until 1050 AD. It had four patio/pyramid complexes, an ancient artificial pond used to reflect the sky and stars, and a ceremonial causeway. These structures had multiple uses: ceremonial spaces, elite residences, burial grounds, and time keeping instruments aligned mathematically to the movements of the stars, mainly the sun, moon, and Venus. The pyramids symbolized political and religious power. People made pilgrimages so they could worship their gods and their ancestors, bringing gifts for the astronomer priests. We followed the same ceremonial path to approach the site. It was about a kilometer (.6 mile) long, extending from east to west, but Don said it seemed much further! There are several closely linked architectural complexes at the site. We could see how the builders echoed the surrounding landscape’s hills and valleys and incorporated them into their structures. First we came to The House of the Wind, a circular structure rising about 2.5 meters high that Albert explained was probably a burial site. Although I took notes as we walked along, it wasn’t easy to keep up with all the information Albert shared. I was especially impressed with the way these ancient people understood the movements of the sun, moon, and stars. They applied this knowledge to develop agricultural and ritual calendars and to construct their pyramids and other buildings in alignment with those movements. In fact, the pyramids across many Mesoamerican sites align so precisely that on the June 21 summer solstice, the sun sets in one pyramid and then sets in the next, in a linked series. Walking to the back of the main pyramid, Athe stages in which it was built. Amazingly, these structures were built without used of pack animals or metal tools. The smaller stones on the bottom were the first stage, and the stones increased in size further up the pyramid walls. You’d think it would be the other way around, with the larger stones forming the base. On one side of the main complex is the House of the Longest Night, consisting of a pyramid basement, sunken patio and platforms. Each had different ceremonial functions. The low walls create a space within which to study the skies and block out distractions. Because of drainage holes in the walls, archeologists think the patios were flooded to create reflecting pools that made it easier to study the celestial movements. Approaching the main pyramid, named The House of the 13 Heavens, we came to a modest–by comparison–set of stairs. Upon viewing them, and then looking at the main pyramid’s staircase, Don decided he didn’t need to see the view from the top and found a shady spot to wait. I, of course, continued on. The second picture shows the whole complex. Again we have low walls surrounding a large courtyard or ceremonial patio, which you can see behind me in the third photo. After crossing the courtyard, we began our ascent. Up, up we climbed, often having to step sideways because the steps were so narrow. Fortunately there were areas on the sides where you could hold on–particularly helpful going down. The view from the top was well worth the climb. There were a few surprises waiting for us at the top, including a small pyramid with a red temple and mural, surrounded by 12 rooms that probably housed the priests. This pyramid atop a pyramid is unique, one of only two in Mesoamerica. During the excavation of the mural, the archeologists discovered a skeleton belonging to an ancestor of the pyramid builders. Carbon dating indicates that this ancient ruler lived in the area 450 BCE or earlier; he was moved to this sacred site for burial under the Red Temple. Based on items found buried with him–a dog, necklaces, other jewelry, pottery, and needles of obsidian or bone–he was clearly of the elite class. Also unique to Cañada de la Virgen is the discovery of the skeleton of a female warrior, the only one in Mesoamerica. Other female skeletons buried in various areas of the site and the number of female symbols lead some archeologists to believe that at times the tribes may have been matriarchal societies. We learned more about the cultural practices of the tribes that settled this area. The elongated shape of some skulls at the various burial sites is evidence of cranial wrapping of infants’ heads. The resulting shape, which resembled corn (a staple of the local diet) was a prized characteristic for the elite class. These tribes were also well-versed in healing arts, using the native herbs and plants to treat many ailments. After the long walk to the site, the sort of strenuous climb, and trying to absorb all that information, I’d worked up an appetite! It was time to move on to a special lunch. I’ll share that and other memorable meals in the next post.